LOS ANGELES, CA--(Marketwired - Jul 13, 2017) - Brentwood Associates, a leading consumer-focused private equity investment firm ("Brentwood"), today announced that it has made a significant non-controlling investment in Blaze Fast-Fire'd Pizza ("Blaze Pizza" or the "Company"). Blaze Pizza is the nation's leading fast-casual pizza chain with over 200 locations throughout the U.S. and Canada. The Company is led by Chief Executive Officer Jim Mizes, who has been with Blaze Pizza since 2013 and will continue to lead the business going forward. Concurrent with the transaction, Blaze Pizza has added Bill Barnum, Rahul Aggarwal and Greg Dollarhyde to its board of directors. Mr. Barnum is co-founder and partner at Brentwood, and Mr. Aggarwal is a partner at Brentwood. Blaze represents the sixth investment in the restaurant industry for Brentwood, including three currently owned California-based concepts Lazy Dog Restaurants, Pacific Catch and Veggie Grill. They are joined on the board by Mr. Dollarhyde, a fast-casual industry veteran who has served as the Chairman or CEO of eight different companies, including former Brentwood portfolio company Zoës Kitchen (NYSE: ZOES). He has also been recognized by Nation's Restaurant News on its Power List of the Top 50 most powerful people in foodservice. Mr. Dollarhyde also invested in the transaction alongside Brentwood through Dollarhyde Investment Group IV ("Dollarhyde"). The Company also announced that Paul Wachter is serving as a Board Observer. Mr. Wachter is the founder and CEO of financial and asset management firm Main Street Advisors in Los Angeles. Mr. Wachter manages one of Blaze Pizza's largest shareholder groups that includes LeBron James, Maria Shriver, Tom Werner, Maverick Carter, and himself. He currently serves on the board of directors of Time Warner and, until recently, the board of directors of Virgin America and the board of regents of the University of California. He previously was on the board of Beats Electronics and Beats Music from the inception of the companies until their purchase by Apple in 2014. The first Blaze Pizza opened on August 6, 2012, in Irvine, Calif. -- less than five years ago -- and quickly gained attention for its chef-driven recipes, thoughtful interior design and a service culture that celebrates individuality. Recently named '#1 Brand of the Year' in the 2017 Fast Casual Top 100, the fast-growing restaurant chain is building momentum and developing a cult-like following as it expands across North America. The company currently operates over 200 restaurants in 32 states and Canada, including the major metropolitan areas of Los Angeles, New York, Chicago, San Francisco, Dallas, Las Vegas, Boston, and Toronto. 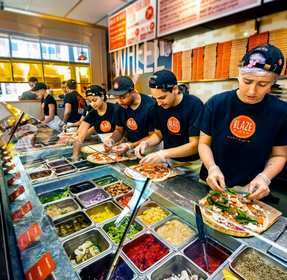 With its newly announced expansion into the Middle East and Northern Africa, Blaze Pizza is on pace to exceed $1 billion in annual system-wide sales before its 10th birthday in 2022. Rahul Aggarwal, partner at Brentwood, commented, "The Blaze team has done an amazing job growing to 200 restaurants in under five years. They have built a scalable concept with moats around their critically acclaimed chef, high quality clean ingredients and aggressive brand building strategies. We are excited to join the company and can't think of a better way to kick off investing our new fund." "We are excited to add Brentwood and Dollarhyde to our investor group as they bring leadership, a network of connections and deep restaurant experience that will simply make us stronger and better," said Jim Mizes, CEO of Blaze Pizza. "As we transition from an emerging brand to an international high growth brand, I know Brentwood and our new board will help us build value for our shareholders, brand awareness across the globe and a great workplace for our team members and our franchisees." Blaze Pizza was advised by North Point Advisors LLC and its legal counsel was Davis Wright Tremaine LLP. Brentwood was represented by Kirkland & Ellis LLP. Blaze Pizza is a modern day "pizza joint," serving up artisanal pizzas that are both fast and affordable. With fans lining up each day for their custom-built pizzas, freshly made salads, blood orange lemonade and s'more pies, the innovative fast-casual concept has quickly become one of the hottest restaurant chains in the country. Each Blaze Pizza restaurant features an interactive open-kitchen format that allows guests to customize one of the menu's signature pizzas or create their own, choosing from a wide selection of fresh, "clean" ingredients -- all for about $8. The generously-sized personal pizzas are then sent to a blazing hot open-flame oven -- the centerpiece of the restaurant -- where dedicated pizzasmiths ensure the thin-crust pies are fast-fire'd and ready to eat in just 180 seconds. Restaurants make fresh dough from scratch using a proprietary recipe developed by Executive Chef Bradford Kent (the "Pizza Whisperer"), which requires a 24-hour fermentation period to produce his signature light-as-air, crisp crust. For pizza fans with specific dietary needs, Blaze Pizza offers gluten-free dough and vegan cheese. Founded by Elise and Rick Wetzel (co-founder of Wetzel's Pretzels), the concept is backed by founding investors that include LeBron James, Maria Shriver and Boston Red Sox co-owner Tom Werner. For more information, visit www.blazepizza.com or www.facebook.com/blazepizza. Brentwood Associates is a leading consumer-focused private equity investment firm with over $2.4 billion of capital under management and a 30+ year history of investing in leading middle-market growth companies. Brentwood focuses on investments in growing businesses where it is able to leverage its extensive experience in areas such as: multi-location strategies, including specialty retail and restaurants; consumer services; direct marketing, including direct mail and e-commerce; health and wellness; and education. Since 1984, Brentwood's dedicated private equity team has invested in over 50 portfolio companies, with an aggregate transaction value of over $6 billion. With significant experience in both investing and brand building, Brentwood is a value-added partner with entrepreneurs and senior management teams building world-class companies. For more information, visit www.brentwood.com.